The 1,800 young Koreans at the Taejon Vocational Training Centre, realizing the value of what they learn there, have asked the Centre to stay open for night sessions. The United Nations Korean Reconstruction Agency (UNKRA) built the Centre on the site of a vocational training centre destroyed during the Korean war; it is one of seven wholly or partially financed by UNKRA, at a total cost of $1,600,000. At all of them, the trades taught are those suited to the needs of the area. At Taejon, entrance examinations select the most capable students, and the principal, Kim In Soo, works closely with Dominick Dinatale (U.S.), the UNKRA consultant, in maintaining high standards. Twenty hours a week are given to academic study, and the rest of the time is spent on training in the Centre's eight workshops, which are equipped with modern machinery and expert instructors. There the students are turned into the machinists, carpenters, surveyors, machine-tool workers and civil engineers needed for Koreans future. 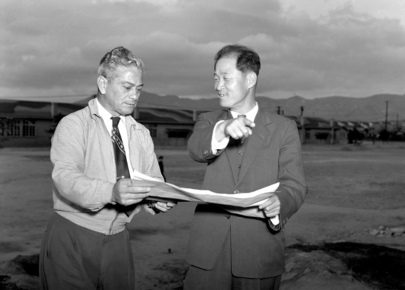 Dominick Dinatale (from Trenton, N.J., U.S.A.) (left), the UNKRA engineering consultant and Kwon Hi Chul, the Centre's Vice-Principal, discuss plans for new buildings to house the expanding programme of technical training for Korean boys.